In August of 2012, in the east end of Toronto, a man approached a woman from behind, put a knife to her throat, and dragged her into a nearby wooded area and assaulted her. She survived but is left to deal with the trauma of this horrible event. This event brings up many issues. One of them is awareness. While it is not always possible to prevent an assault, developing greater awareness will better your chances. Here are some basic "awareness-enhancing" habits that you can blend into your daily routines. Don't Impair Your Senses. Texting, earphones etc... impair your sight and hearing, limiting your ability to sense potential dangers. Look Around. Besides developing a sense of your surroundings you are communicating to a potential assailant that you will not be easy to surprise. Scan everywhere, especially behind you. Scan for exits. If you need to flee the scene it saves time if you know where to go. Hiding spots. Around the corner of a building, between vehicles, behind some trees...? If someone wanted to surprise you where would they hide? Scan for Common Objects. Are there common objects on your person (coins, keys) or in the area (chair, cups...) that you can use to defend yourself? How to get help? A police station, pressing the yellow strip on the Toronto subway, bystanders, 911... Be aware of who can help and how to reach them. 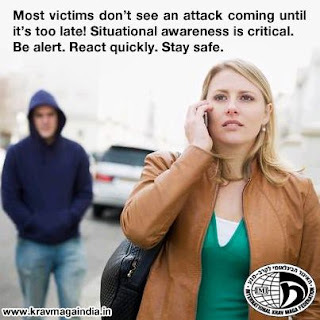 You don't have to walk with your head on a swivel but being aware of your surroundings is vital to prevention - the best self defense. These practices won't come naturally at first but if you begin including them in your routines they will become useful and potentially life saving habits.